Harrison pride themselves on their 100% natural fillings used in their hand-made mattresses. 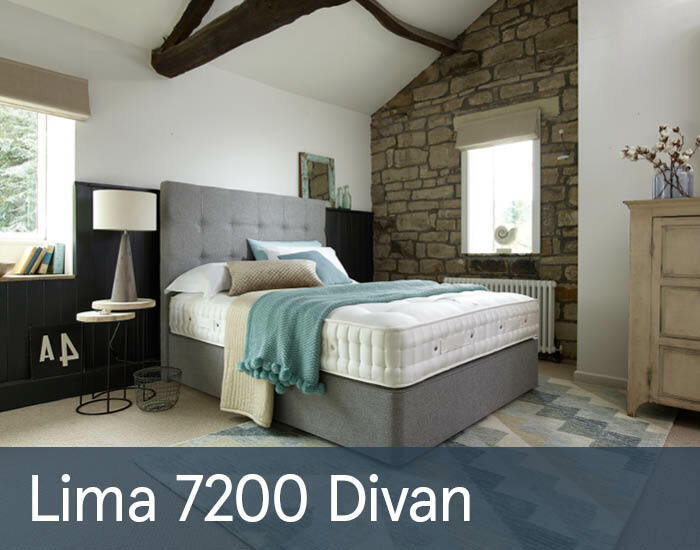 Lima 7200 range is a pocketed sprung mattress with natural fillings such as soft cotton, absorbent wool-and-viscose blend. Topped with a naturally fire-resistant ChemFree mattress fabric, the fillings help wick away moisture for a cool, dry sleeping environment. Platform top deep base provides additional support. The Lima is a no turn mattress, but regular rotation from head to toe will extend the mattresses life span. Available as a mattress or divan set with different headboard and storage options. Please call us on 0845 901 4000 or visit your nearest Cousins store for more details.